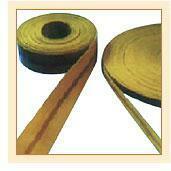 Small woven endless belts: Suitable for applications in which less vibration is produced near the driven pulley. These belts are designed as elastic belts, semi-elastic belts and non-stretch belts. Higher power flat belts: They are made up of abrasion-resistant rubber. This eliminates the high tension applied to grip pulleys. Working Load: The maximum weight or mass that a belt can support which is expressed in pounds. Length: This is the linear distance measured from one end of the belt to the other and expressed in inches or millimeters. Weight: This refers to the heaviness of the flat belt and expressed in kilograms or pounds. Thickness: This is the distance between two surfaces of a rubber flat belt and expressed in millimeters or inches. Reduction of sudden shocks or changes in loading. Heavy industrial devices and Machine tools.